About 80 demonstrations were successfully demonstrated in 2 blocks of Bikaner district. Our field team worked day and night and completed the whole demonstration in less than 3 months. 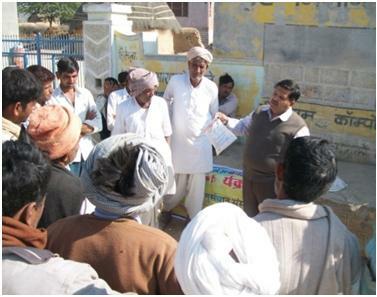 Dr. Ashok Bijj, Animal husbandry department, BIKANER kept the tempo high of all field staff. 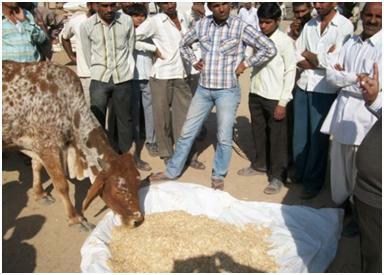 At each demonstration preparation of nutritive fodder was done by adding mineral mixture, Urea (1 %) and Jaggery to raw fodder (thudi). Information on prevention and cure of common diseases lice problem in animals and its solution were also detailed. Free medicine antibiotics were distributed to the livestock owners and small and land less persons having livestock keeping as their main occupation.